But the Lord did not intend Father John Veniaminov to fulfill God's call in Irkutsk. Divine Providence led him onto the path of apostolic service in the distant Aleutian Islands. In later life Saint Innocent would recall how after an inner struggle he had said: "Blessed be the name of the Lord!" and was consumed by a burning desire to devote himself to the service of people ignorant of Christ, but, according to eyewitnesses, eager to hear the teachings of the Gospel. It was from this point in time and place that the man who in his own lifetime became known as "the apostle of America" began his indefatigable apostolic mission, a mission that was to last almost half a century. His apostolic feats were achieved in the severest climatic conditions constantly fraught with mortal danger. Father John Veniaminov's parish included not only the island of Unalaska, but also the neighboring Fox Islands and Pribilof Islands, whose inhabitants had been converted to Christianity before his arrival, but retained many of their pagan ways and customs. Their new spiritual father often had to travel from one island to the other, battling through the stormy ocean waves on a fragile canoe, at enormous risk to his own life and limb. His travels over the islands greatly enhanced Father John Veniaminov's familiarity with the local dialects. In a short time he had mastered six local dialects, and selecting the most widespread of these, he devised for it an alphabet of Cyrillic letters, and translated into that dialect the Gospel according to St. Matthew, as well as the most frequently used prayers and hymns. These were so successfully adopted by the local populace that they soon displaced the shamanic chants. The zealous missionary waged a vigorous campaign against the vicious practices of the natives, and soon succeeded in eliminating them. 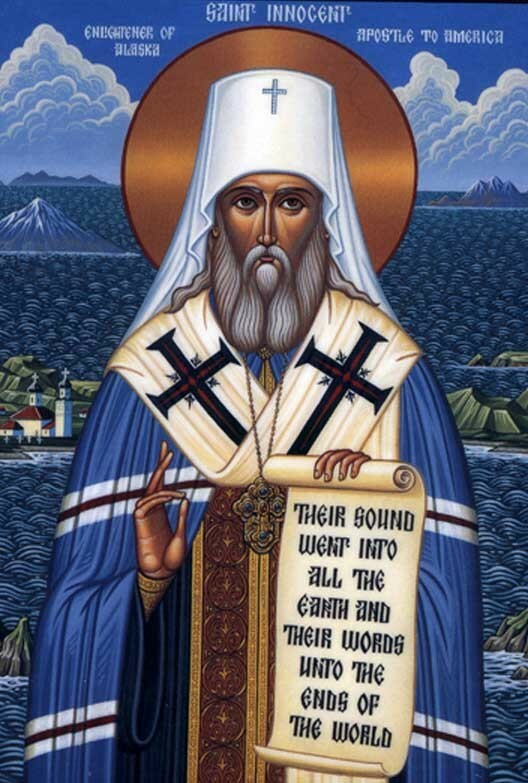 Father John Veniaminov's first translations, the Catechism and the Gospel According to St. Matthew, appeared in Aleut (Fox Island dialect) in 1828. He also wrote an article in this language, The Indication of the Way into the Kingdom of Heaven, and compiled a grammar for this Aleut dialect. Father John Veniaminov's zeal was not confined to the propagation and affirmation of Orthodoxy amongst only the Aleutians, and so in 1829, with the blessing of Bishop Michael of Irkutsk, he undertook a journey to the American mainland, to Nushagak, where he brought the word of Christ to the inhabitants of the Bering seacoast, and baptized those who believed. In contemporary descriptions of Father John Veniaminov's fifteen-year missionary service on the islands of Unalaska and Sitka, he was likened to St. Stephen of Perm. His sound judgment and common sense earned him access to the coarse, but simple and good hearts of the local people. The truths of Christ's teaching were conveyed to them in accordance with their mental development: they were instructed in an atmosphere of total freedom of belief, and the truths were not forced upon them. 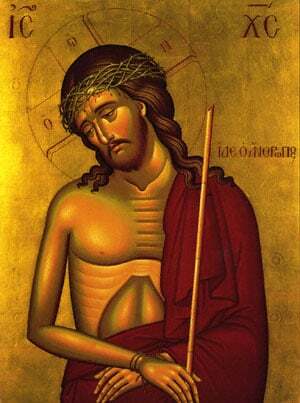 Father John Veniaminov patiently waited until people manifested a desire to be baptized. A school was built for the local children, and he provided it with readers and textbooks that he composed and translated by his own hand into the local dialects, and he was their teacher. After leading them into the light of the Gospel, he instructed them in various crafts and trades, he even taught the Tlingits how to vaccinate. This approach won him the trust of the stubborn pagans. Father John Veniaminov's contemporaries record that the natives loved their teacher and illuminator like a real father, since he was indeed both benefactor and father, teacher and patron to his spiritual children that he had saved for Christ.